It’s no secret that web browsers rank among the most popular software for daily use, but this popularity also makes browsers an appealing target for viruses, malware, and hackers. In today’s episode, we’re going to tackle this issue with 5 ways to ensure a safe and secure Internet browsing experience. On this week’s episode, we’re going to do something a bit different, and rather than focusing on one topic, we’ll be answering some listener questions on-air! Please feel free to shoot us an e-mail if you ever have a question about a topic we’ve covered, have a specific topic you’d like us to cover in the future, or need some advice when it comes to the security of your devices — we love hearing from our listeners! It’s estimated that 120 million people shopped online on Cyber Monday in 2015, and that number is sure to be even higher this year! That’s a lot of gift shopping — and a lot of opportunities for something to go wrong. While shopping online is convenient, it also carries some security risks. On today’s Checklist: Five things you can do to make your online shopping more secure. Today’s topic: travel. Millions of people travel substantial distances every day, whether it’s for business or pleasure. For the safety of your devices and the security of your data, there are a few things you’ll want to do. Today we’ll look at several ways you can prepare and keep yourself safe on your trip. With malware attacks on the rise, more and more news coverage is devoted to analyzing these threats. On today’s show we’re going to help you make sense of all that security gibberish by demystifying the terminology and acronyms frequently encountered when it comes to malware. On today’s show we’re going to cover what makes a piece of spyware different from a worm, and what makes a keylogger different from adware. Once you can tell the difference between the different types of malware, you’ll be better prepared to understand just how the different types of threats can affect *you*, and which ones are worth losing sleep over! On today’s episode, we’re hitting best practices when it comes to login and password security — simple steps you can take to keep your accounts from falling into the wrong hands, and what to do in the event that your password has been compromised. On today’s episode, we’re talking about the latest version of Apple’s desktop operating system, the newly rebranded macOS Sierra. Specifically, we’re going to be focusing on some of the new and expanded security features found in macOS 10.12. Internet criminals can be pretty devious, and it’s becoming increasingly harder to determine legitimate sites from fake ones these days. In today’s episode, we’ll go over five ways to identify and avoid online scams, helping to keep your personal data (and the contents of your bank account!) out of the hands of online con-artists. On today’s episode, we’re going to run down a checklist of steps to take before selling, donating, or giving away your old Mac. These steps will ensure the secure removal of your personal information and data from your old computer, and help make your transition to a new computer go as smoothly as possible. In today’s episode, we’re covering the remaining five items on our list of 10 things to do when setting up a new Mac. We’ll be covering specifics when it comes to protecting your data, and discuss the best ways to safeguard your privacy. 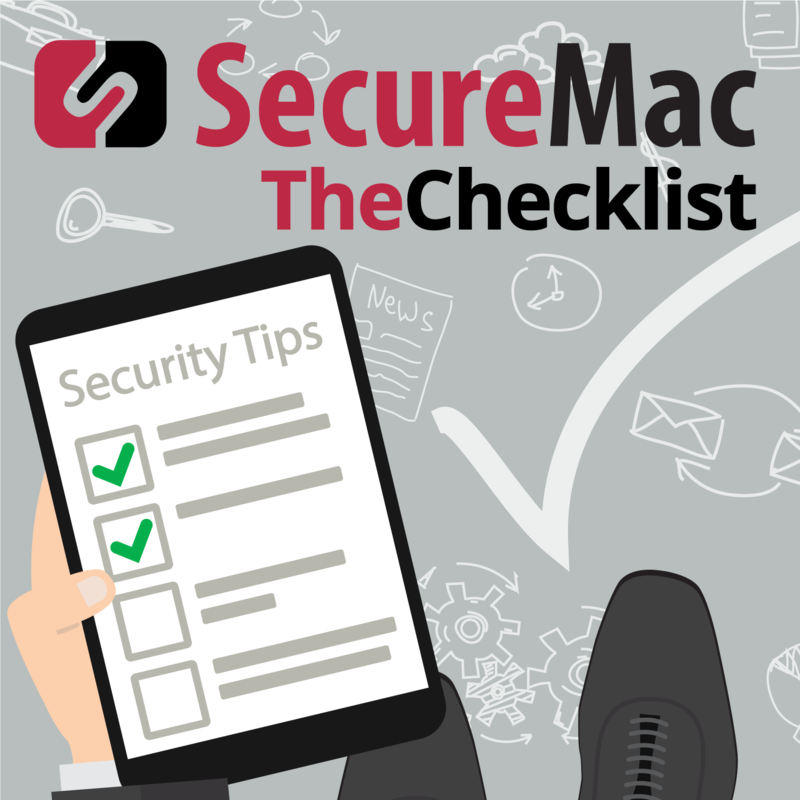 In this week’s episode of The Checklist, we discuss the first five items on our list of 10 things to do when setting up a new Mac to strengthen your security. Next week, we’ll cover the remaining five items, including specifics on protecting your data and safeguarding your privacy. In this week’s episode of The Checklist, we discuss 5 things to do after getting a new iPhone to make the process of transferring data from your old device and configuring security settings as simple as possible. In this week’s episode of The Checklist, we discuss 5 things to do before selling your old iOS device to ensure safe and secure removal of your private information, as well as ways to maximize resale value.